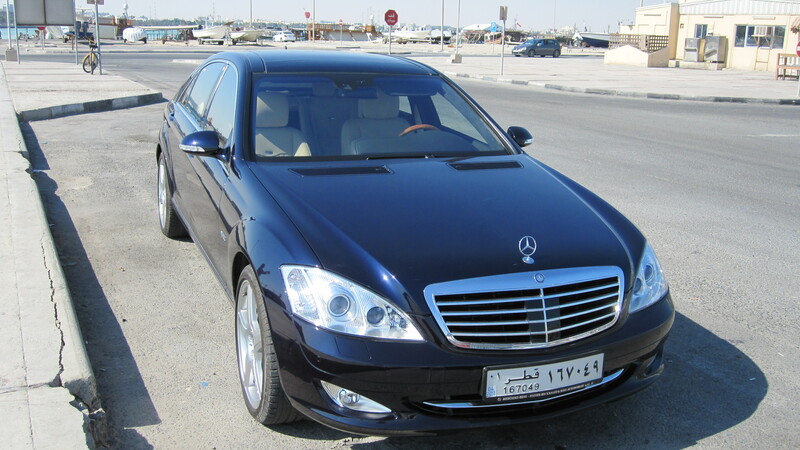 A typical city tour in your typical Qatari car – a Mercedes S Class complete with massaging seats. Being chauffeured around in such a nice car just felt wrong considering we were hitting some dusty bumpy roads towards the first stop at the Doha camel markets. 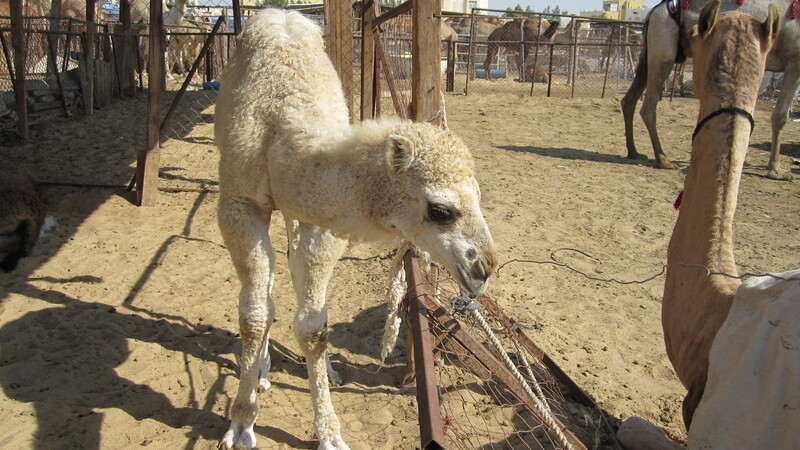 The markets were a strange place, really a collection of temporary fences housing all different types of camels. With houses from the rapidly developing and encroaching city surrounding on all sides. My driver explains to me that, most of the camels have been walked here by Bedouins and other camel traders from as far away as Pakistan (Now that’s a long walk!) Many of the camels looked like they had walked that far too, with worn patches on their legs and knees and generally tired and fatigued. It wasn’t really comforting to know that animals in this poor condition would likely be served on dinner tables later that night. Especially after having a nice pet or two with some of the younger ones. And yes.. they will love to spit on you if given the chance. 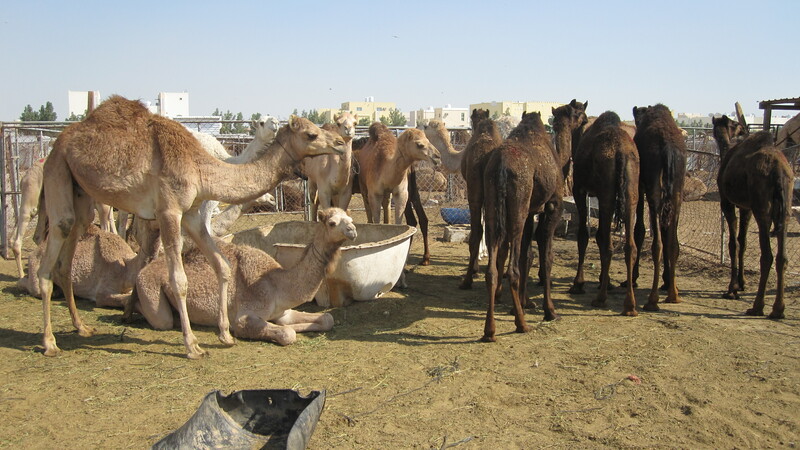 Camels waiting to be sold at the camel market. Baby camel ready for the abattoir. 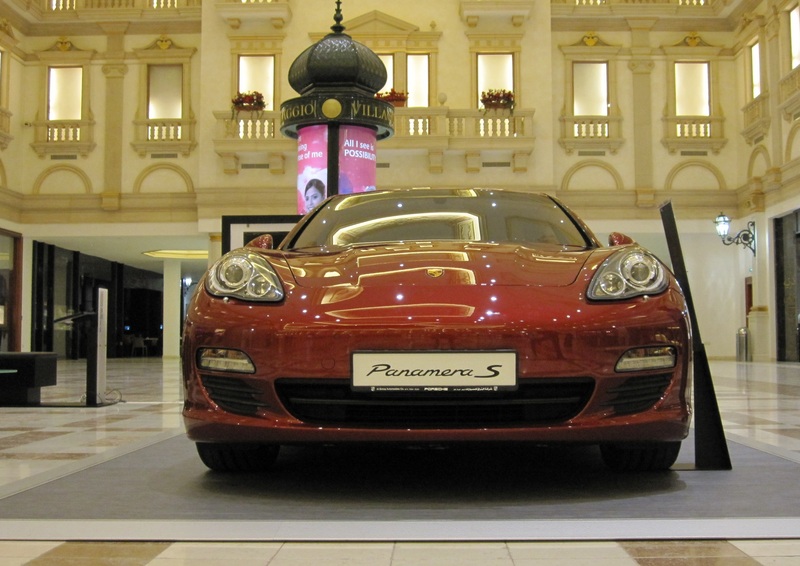 From a tired and dusty camel market to one of the world’s premier luxury developments. The Pearl is Qatar’s answer to Dubai’s Palm. 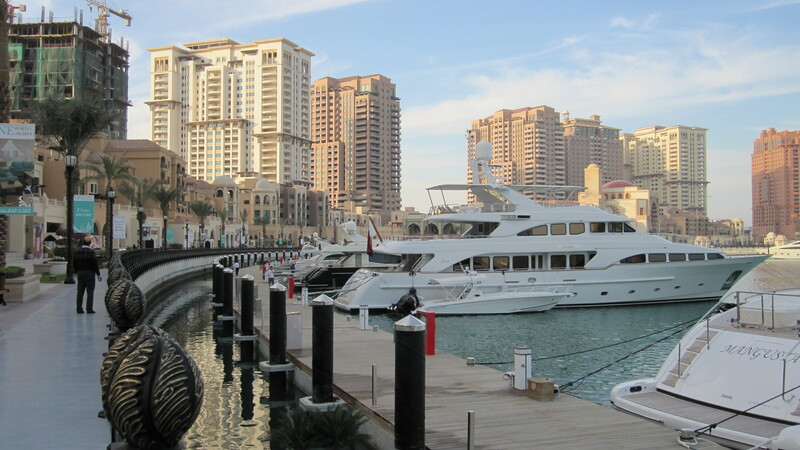 A development made offshore using reclaimed land. Instead of streets there are water channels and it’s very feasible that residents here commute by boat to work. 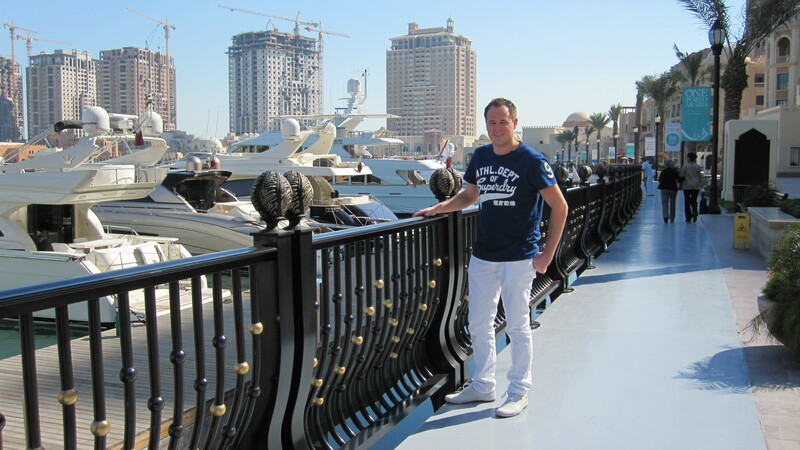 There is a series of low-rise apartments around circular bays of water, all have a promenade of shops at the bottom. 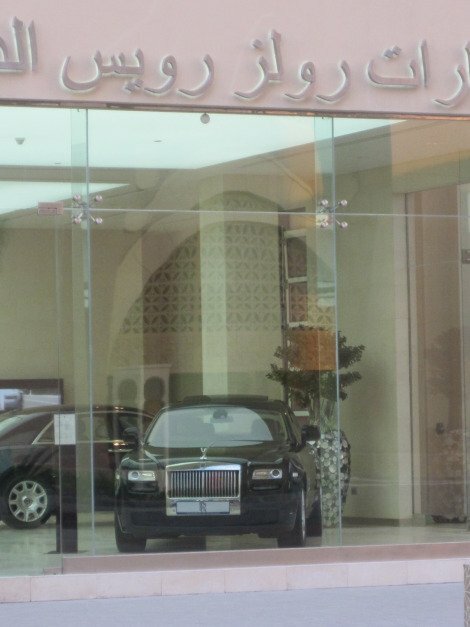 Whilst most apartment complexes like this might have a convenience store at the base, here you will find dealerships for Rolls Royce and Ferrari, fashion stores like Gucci and Jimmy Choo, and if you need a coffee the Armani Cafe is ready to make up your cafe latte. The spirit’s well and truly on spending money as this poster below shows. 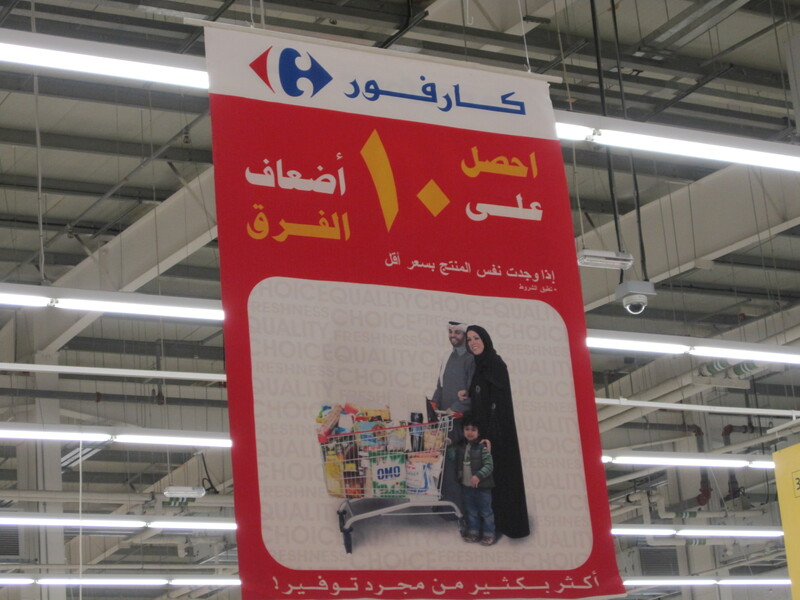 Like many new metro centres this place was sand and dust less 10 – 15 years ago. 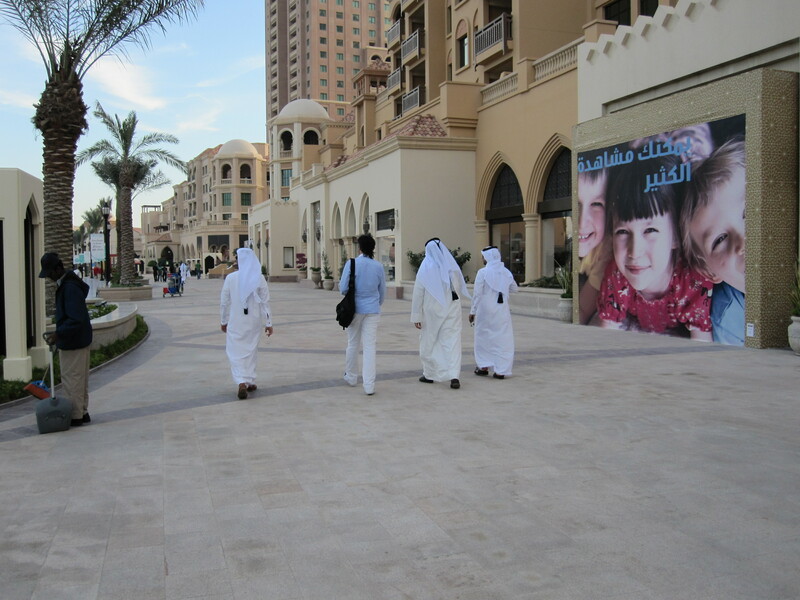 with most of the previous development having been constructed on the other side of the bay adjacent to the Corniche. Now Doha City Centre is home to some of the most architecturally stunning skyscrapers in the world. Equally stunning is the fact that they are 90% empty. They’ve been built in anticipation that a boom is coming. Given the fact that they won the world cup and are hosting a crazy amount of important world events, you can safely say the boom will well and truly arrive. 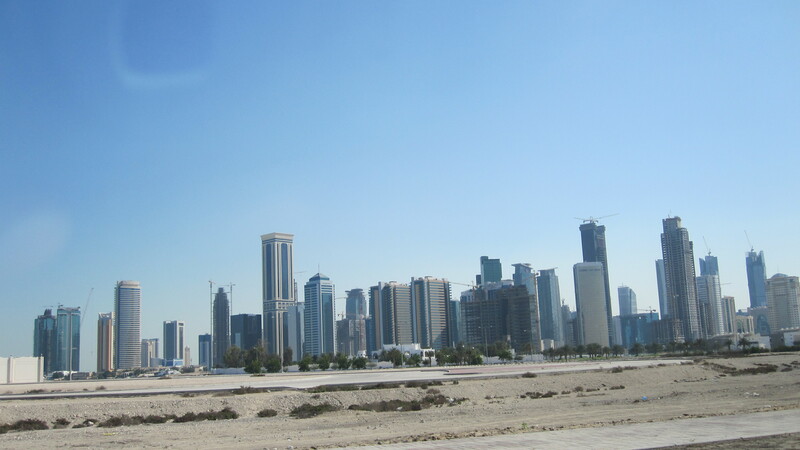 The relatively new Doha skyline emerges from the desert. Construction happening around newly completed towers. 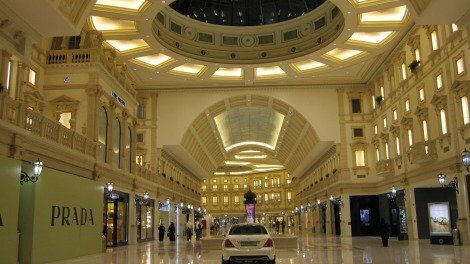 Here is one of two major shopping centres in Doha and in two days here, it’s the first time that I’ve had the chance to mix with actual Qataris. What do you find in here? Well an Ice Skating Rink, a massive Carrefour and like the rest of Qatar a branch or two of every US fast food chain you can think of…oh and the strangest toilets I’ve ever seen. Mostly in Qatar Western and Arab toilets are separate, and this is a few place where they are together. You can see that wearing a Jalaba can make squatting easy, oh and be sure to use the provided hose to clean off when you’re done. 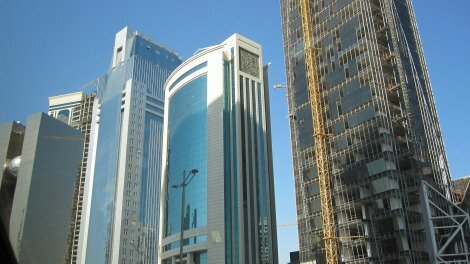 In the western world we find this quite strange, but in actually fact the arab way is sure to be much cleaner than scrunching up some dry paper. 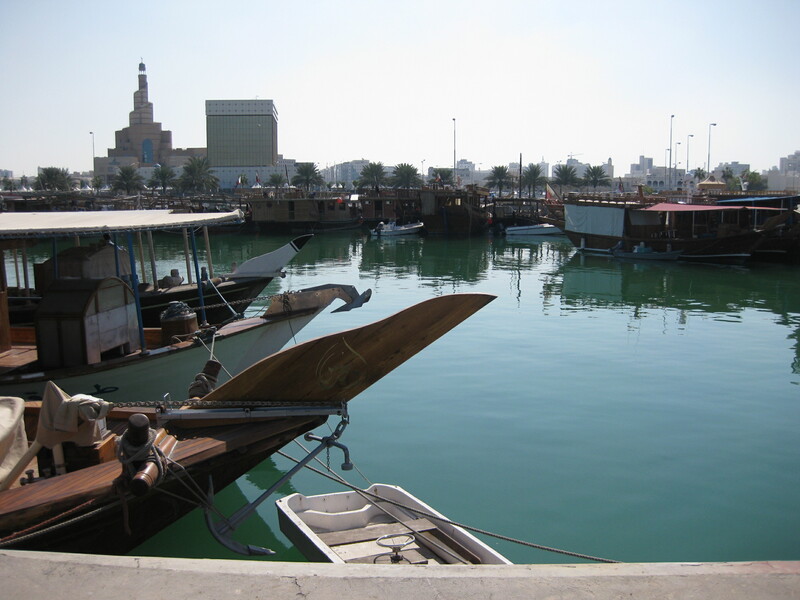 Full of fatty food and credit card taken a hit it’s time to move on to a taste of old Qatar (ie pre 1997) and check out the pearling boats that used to be the lifeblood of the country. Actually.. they aren’t that interesting. Time for another shopping mall. 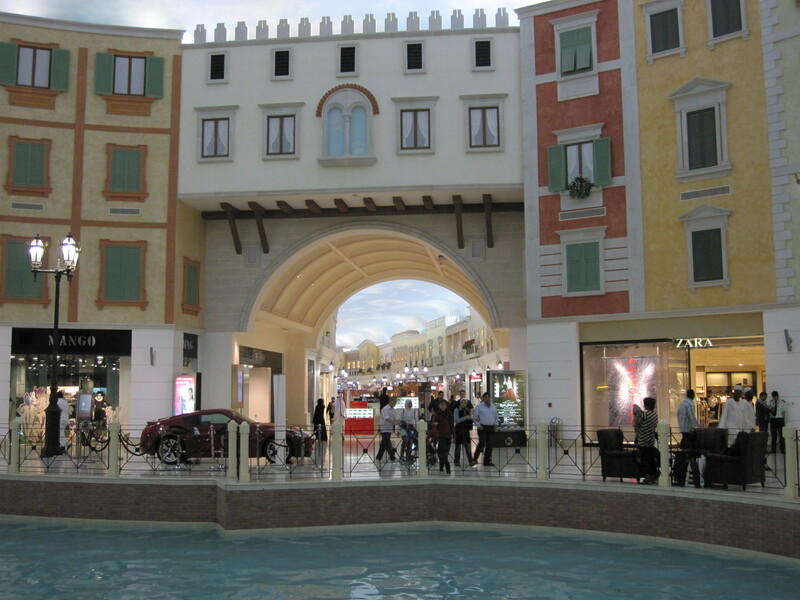 The Villagio is a Venetian themed shopping centre, built next to the national stadium for the 2006 Asian Games. Here is were the Las Vegas similarities get even closer. 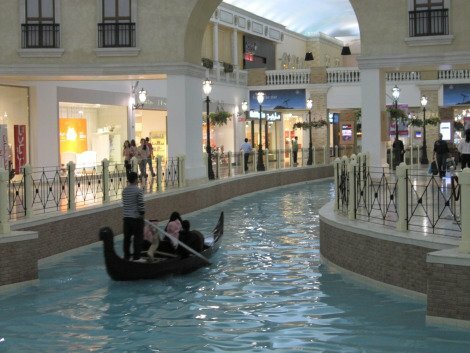 This place is almost a direct copy of the Venetian Casino, complete with canals for gondola rides, a fake blue sky with fluffy clouds painted on the roof and shops stylised to look just like the buildings of Venice. 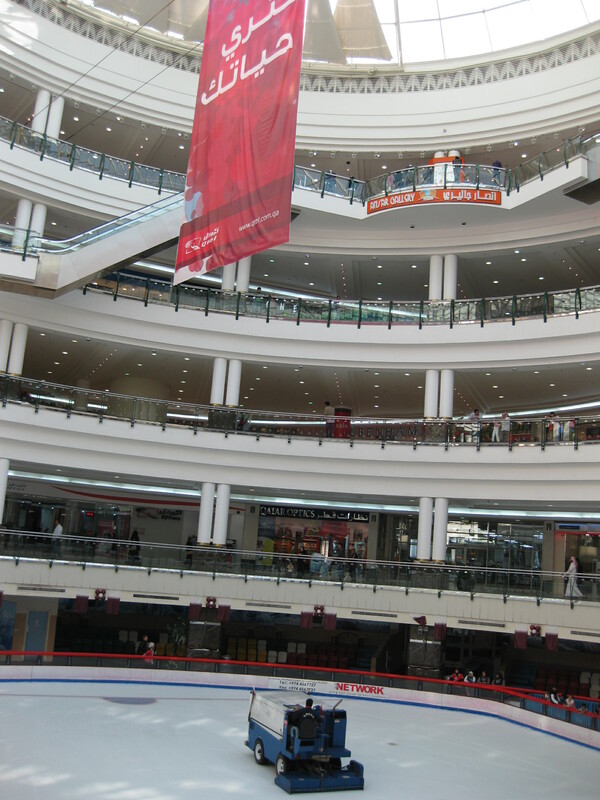 However the only tables you will find here are the ones in the very ample food court. Gambling is very much prohibited. 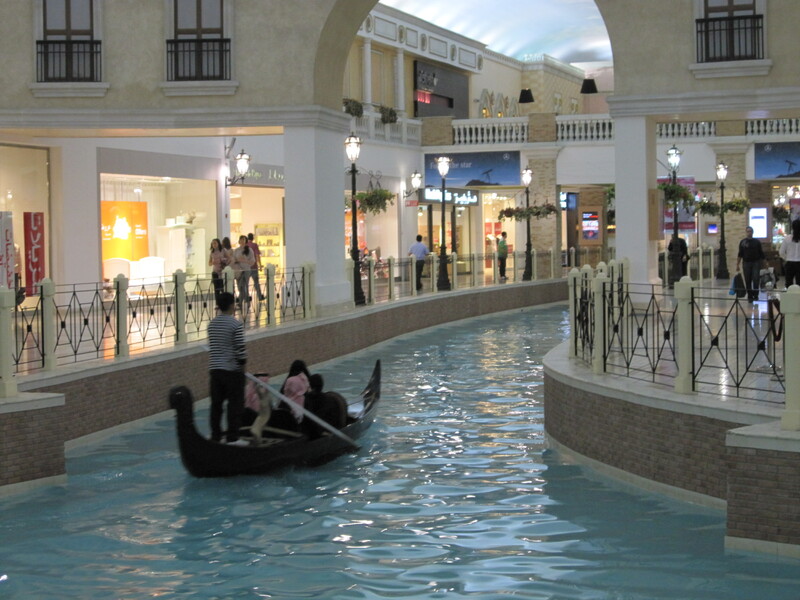 Just your everyday fake indoor Venice. What is allowed is luxury and lots of it. If I thought the Pearl was packing some premium brands it was nothing until I entered the the Via Domo luxury zone. 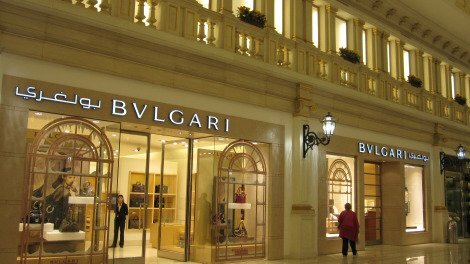 Cartier, Bvlgari, and even Baby Dior line the alleyways, whilst the middle of the corridors is reserved for casual leasing where you can by a Porsche, Bentley or even a Mercedes if you’re feeling cheap. This has been a strange day. I think I need a drink to sort this out. Thankfully back at the hotel is one of the best stocked Champagne bars I’ve ever experienced. 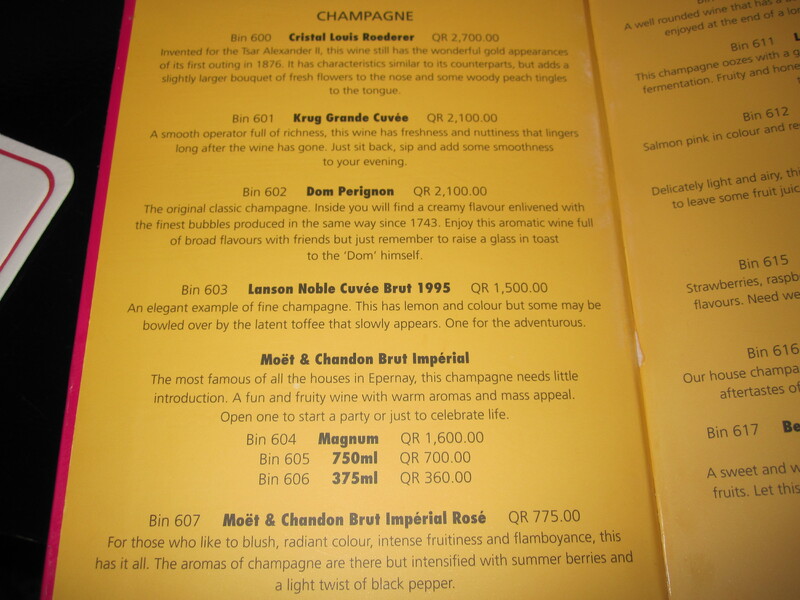 Check out the blurry menu below. CONTINUED IN PART 3: Featuring smoking hooka in the old souq, the Islamic museum of Art and dressing like a local. This entry was posted in Alone In..., Asia, Travel. Bookmark the permalink.